Genesis 2:7-17 is part of the first “generations” section of the book which begins in Genesis 2:4, if the preceding material is taken as a kind of introduction to the following divisions. 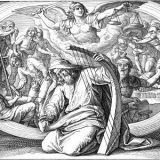 It is a foundational section not only for Genesis, but also for all of Holy Scripture, since it includes the creation of man, the creation of woman, the fall into sin, and the murder of Abel. 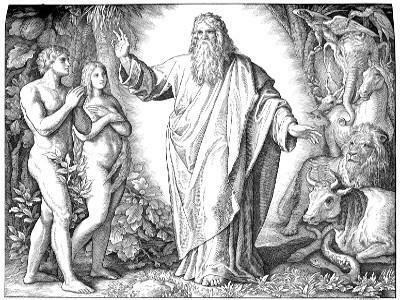 Moses has different purposes in mind here than he did in the introduction of Genesis, and the “generations” structure helps illustrate this. “These are the generations of the heavens and the earth” points to what comes after them. 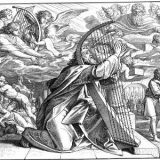 The primary focus is the generations and not the generator, which is why the “generations of Terah” in Genesis 11:27, for example, is primarily concerned with Abraham, his son. This first section, therefore, is concerned primarily with the “descendants” of God and the heavens and the earth: man, particularly Adam and his family. This reading is also an excellent exercise in Biblical interpretation, because every passage of Scripture is important. Genesis 2:10-14 is a geography lesson which we will explore in more detail, but there is a sinful inclination to dismiss it as irrelevant. But the Holy Spirit does not speak in vain: “For whatever was written in former days was written for our instruction, that through endurance and through the encouragement of the Scriptures we might have hope” (Romans 15:4; see also 1 Corinthians 10:11 and 2 Timothy 3:16-17). If the passage in question seems pointless, the problem is with us, because we do not understand. Consider, then, the first part of this reading. God creates Adam from the dust of the ground and breathes into him the breath of life. He also plants a garden in Eden and places every good tree in it. The Lord is our Creator and apart from Him there is no life. However, note that the garden is placed in Eden. The garden itself is not named Eden! The reference is a specific location, which Moses clarifies below, not a world-garden or anything of the sort. This is especially important because Adam is created outside of Eden and placed into it. He is not in the garden “by right,” but because of God’s almighty Providence. Everything which Adam has belongs “by right” to God, and Adam receives it because of God’s love toward him. The Lord “makes his sun rise on the evil and on the good, and sends rain on the just and on the unjust” (Matthew 5:45). In Eden, just as now, everything we have is a gift. The special trees also emphasize this. God does not give the tree of life as a kind of super-fruit which perpetuates physical life. He gives the tree as a constant reminder that life flows from God and is not ours “by right.” The tree of the knowledge of good and evil is also not a super-fruit which brings death or knowledge in eating it. It is a sign toward Adam of his creaturehood: what is good and what is evil is the prerogative of God and not man. What is good? To listen to His voice and not eat of this tree. What is evil? To disobey His voice and eat of this tree. God speaks and man listens. If this seems unjust or arbitrary, this speaks to our sinful nature. Adam was not content to be a hearer and desired to be the judge instead. This sinful desire against our creaturehood is the basic root of all sin. All of this brings us to the geographical description of Eden. This section has a real point and should not be passed by for two reasons. First, it is not good to dismiss this as being the geography of the pre-Flood world which is no longer in existence. Such an approach is too easy, by which I mean that it consigns the description to being useless for us, whether intentionally or unintentionally. Second, Moses writes this with a view to his hearers. Why would he write something which would be incomprehensible even to those who first heard it? The mention of Assyria itself in Genesis 2:14 is proof of this. Moses is writing with real geography in mind to describe a place which could, in fact, be located. Nor is it sufficient to say that we no longer have rivers named Gihon or Pishon, because place-names change all the time, even in the Bible (Jerusalem was called Jebus by the Jebusites, for example in Judges 19:11). The world has, of course, physically changed over the course of time. Rivers flow in different beds than they did in ancient days, especially in a shifting land like Mesopotamia. Nor should an attempt to locate Eden be taken as a kind of “proof” for the Bible, because men would worship such a “proof” as an idol, like they did the bronze snake which they named Nehushtan (2 Kings 18:4). But even if we cannot accurately locate Eden anymore, Moses is not writing fantasy. Eden was a real place and had a real garden. The Flood may have wiped it away, but we are not told this. It is entirely possible that the Flood changed essentially nothing, geographically speaking. It was, to use an expression of George Stoeckhardt, a “wonder-judgment.” Being a miracle, we are called to believe the one who speaks with authority through His holy Scriptures. “Where were you when I laid the foundation of the earth? Tell me, if you have understanding” (Job 38:4)! Therefore, I think two serious possibilities exist. The first is a bit more difficult reading, but in my opinion (and only as an opinion) a more likely. If one follows Genesis 2:10 upstream by translating “became four rivers” with the more literal “became (or had) four heads,” this would place the region of Eden near what is now the Persian Gulf. The Tigris and the Euphrates empty into the Gulf. If one reads this passage from the context of the land of Israel, the Pishon and the Gihon are the “furthest away” in the east. The Tigris and the Euphrates are respectively “closer.” Therefore, the Pishon may be the modern Karun in Iran and the Gihon the modern Karkheh (also called the Ulai river in Daniel 8:2). All of these rivers join together into one before dumping into the Gulf. The difficulty is, of course, having to “read upstream,” which is more awkward. The other possibility is placing Eden near the actual headwaters of the Tigris and the Euphrates in modern Armenia, which are actually quite close to each other. The Pishon and the Gihon would be rivers flowing in opposite directions, probably into the Black Sea and/or the Caspian. This has the advantage of being a more “natural” and “downstream” reading, but these rivers have never been known to actually connect. It is not impossible, since Sodom used to be “well watered everywhere like the garden of the Lord” (Genesis 13:10). Ultimately, these two possibilities are better than relegating this to myth or engaging in allegory. Identifying the Pishon and the Gihon with other, but farther away, world rivers is not helpful for this reason. Better to consider real options than engaging in sheer fancy. Three final observations. First, the names of the rivers are instructive. The Pishon is likely derived from the word meaning “to leap, jump” used in Jeremiah 50:11, Nahum 3:18, Habakkuk 1:8, and Malachi 4:2. Pishon therefore means “Jumper” or maybe “Bubbler,” emphasizing its liveliness. The Gihon likely comes from the verb meaning “to burst forth” used in Judges 20:33, Ezekiel 32:2, Micah 4:10, Job 38:8, and Job 40:23. Gihon therefore means “Gusher” or “Charger.” Such names are fitting for rivers which are connected to the one (nameless!) river which flows through the garden of God. Second, Moses records that the land of Havilah was filled with all kinds of “expensive” things, like gold and precious stones (Genesis 2:11-12). Bdellium itself may be a resin, an incense related to myrrh, though this is uncertain. What is certain is the general wealth of that land. However, note the location. Gold and “expensive” things are not in the garden. They are not evil, but they are also not necessary. To obtain them, Adam would have to leave Eden. In Eden is life and the words of the living God. Gold is good, but the Gospel is far better. “The rules of the Lord are true, and righteous altogether. More to be desired are they than gold, even much fine gold; sweeter also than honey and drippings of the honeycomb” (Psalm 19:9-10). “Man does not live by bread alone, but by every word that comes from the mouth of God” (Matthew 4:4). “One thing is necessary. Mary has chosen the good portion, which will not be taken away from her” (Luke 10:42). Finally, the Lord places Adam into the garden to work it and till it. Work is not in itself evil. Toil where the fruits do not match the labor is the curse laid upon mankind (Genesis 3:17-18). Work is God-pleasing. “If anyone is not wiling to work, let him not eat” (2 Thessalonians 3:10). “Look carefully then how you walk, not as unwise but as wise, making the best use of the time, because the days are evil” (Ephesians 5:15-16). Like the giving of the Law in Eden, work precedes the Fall and is therefore a part of God’s good creation.